We enhanced the total transmission of light through a disordered waveguide with spatially inhomogeneous scattering and loss by shaping the incident wavefront of a laser beam. Using an on-chip tapered lead, we were able to access all input modes in the waveguide with a spatial light modulator. The adaptive wavefront shaping resulted in selective coupling of input light to high transmission channels, which bypassed the regions of higher scattering and loss in the waveguide. 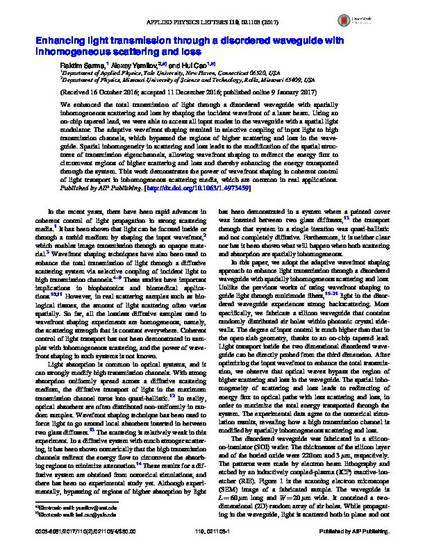 Spatial inhomogeneity in scattering and loss leads to the modification of the spatial structures of transmission eigenchannels, allowing wavefront shaping to redirect the energy flux to circumvent regions of higher scattering and loss and thereby enhancing the energy transported through the system. This work demonstrates the power of wavefront shaping in coherent control of light transport in inhomogeneous scattering media, which are common in real applications.